This article is about the university's main campus in downtown Toronto. For other uses, see University of Toronto (disambiguation). The University of Toronto (UofT, or UToronto) is a public research university in Toronto, Ontario, Canada, located on the grounds that surround Queen's Park. It was founded by royal charter in 1827 as King's College, the first institution of higher learning in the colony of Upper Canada. Originally controlled by the Church of England, the university assumed the present name in 1850 upon becoming a secular institution. As a collegiate university, it comprises eleven colleges, which differ in character and history, each with substantial autonomy on financial and institutional affairs. It has two satellite campuses in Scarborough and Mississauga. The university is commonly ranked as the best Canadian university, according to various major publications. Academically, the University of Toronto is noted for influential movements and curricula in literary criticism and communication theory, known collectively as the Toronto School. The university was the birthplace of insulin and stem cell research, and was the site of the first practical electron microscope, the development of deep learning, multi-touch technology, the identification of the first black hole Cygnus X-1, and the development of the theory of NP-completeness. By a significant margin, it receives the most annual scientific research funding of any Canadian university. It is one of two members of the Association of American Universities outside the United States, the other being McGill University in Montreal, Quebec, Canada. The Varsity Blues are the athletic teams that represent the university in intercollegiate league matches, with long and storied ties to gridiron football and ice hockey. 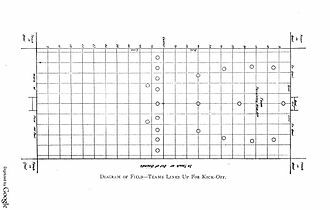 The earliest recorded college football game was played in the University of Toronto's University College in the 1860s. The university's Hart House is an early example of the North American student centre, simultaneously serving cultural, intellectual, and recreational interests within its large Gothic-revival complex. The University of Toronto has educated three Governors General of Canada, four Prime Ministers of Canada, four foreign leaders, and fourteen Justices of the Supreme Court. As of March 2019, ten Nobel laureates, five Turing Award winners, 94 Rhodes Scholars, and one Fields Medalist have been affiliated with the university. The founding of a colonial college had long been the desire of John Graves Simcoe, the first Lieutenant-Governor of Upper Canada. As an Oxford-educated military commander who had fought in the American Revolutionary War, Simcoe believed a college was needed to counter the spread of republicanism from the United States. The Upper Canada Executive Committee recommended in 1798 that a college be established in York, the colonial capital. On March 15, 1827, a royal charter was formally issued by King George IV, proclaiming "from this time one College, with the style and privileges of a University ... for the education of youth in the principles of the Christian Religion, and for their instruction in the various branches of Science and Literature ... to continue for ever, to be called King's College." The granting of the charter was largely the result of intense lobbying by John Strachan, the influential Anglican Bishop of Toronto who took office as the college's first president. The original three-storey Greek Revival school building was built on the present site of Queen's Park. Under Strachan's stewardship, King's College was a religious institution closely aligned with the Church of England and the British colonial elite, known as the Family Compact. Reformist politicians opposed the clergy's control over colonial institutions and fought to have the college secularized. In 1849, after a lengthy and heated debate, the newly elected responsible government of Upper Canada voted to rename King's College as the University of Toronto and severed the school's ties with the church. Having anticipated this decision, the enraged Strachan had resigned a year earlier to open Trinity College as a private Anglican seminary. University College was created as the nondenominational teaching branch of the University of Toronto. During the American Civil War, the threat of Union blockade on British North America prompted the creation of the University Rifle Corps, which saw battle in resisting the Fenian raids on the Niagara border in 1866. Established in 1878, the School of Practical Science was precursor to the Faculty of Applied Science and Engineering, which has been nicknamed Skule since its earliest days. While the Faculty of Medicine opened in 1843, medical teaching was conducted by proprietary schools from 1853 until 1887, when the faculty absorbed the Toronto School of Medicine. Meanwhile, the university continued to set examinations and confer medical degrees. The university opened the Faculty of Law in 1887, followed by the Faculty of Dentistry in 1888, when the Royal College of Dental Surgeons became an affiliate. Women were first admitted to the university in 1884. A devastating fire in 1890 gutted the interior of University College and destroyed 33,000 volumes from the library, but the university restored the building and replenished its library within two years. Over the next two decades, a collegiate system took shape as the university arranged federation with several ecclesiastical colleges, including Strachan's Trinity College in 1904. 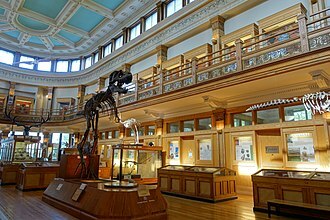 The university operated the Royal Conservatory of Music from 1896 to 1991 and the Royal Ontario Museum from 1912 to 1968; both still retain close ties with the university as independent institutions. The University of Toronto Press was founded in 1901 as Canada's first academic publishing house. The Faculty of Forestry, founded in 1907 with Bernhard Fernow as dean, was Canada's first university faculty devoted to forest science. In 1910, the Faculty of Education opened its laboratory school, the University of Toronto Schools. The First and Second World Wars curtailed some university activities as undergraduate and graduate men eagerly enlisted. Intercollegiate athletic competitions and the Hart House Debates were suspended, although exhibition and interfaculty games were still held. The David Dunlap Observatory in Richmond Hill opened in 1935, followed by the University of Toronto Institute for Aerospace Studies in 1949. The university opened satellite campuses in Scarborough in 1964 and in Mississauga in 1967. The university's former affiliated schools at the Ontario Agricultural College and Glendon Hall became fully independent of the University of Toronto and became part of University of Guelph in 1964 and York University in 1965, respectively. Beginning in the 1980s, reductions in government funding prompted more rigorous fundraising efforts. The University of Toronto was the first Canadian university to amass a financial endowment greater than C$1 billion in 2007. The university grounds lie about 2 kilometres (1.2 mi) north of the Financial District in Downtown Toronto and immediately south of the neighbourhoods of Yorkville and The Annex. The site encompasses 71 hectares (180 acres) bounded mostly by Bay Street to the east, Bloor Street to the north, Spadina Avenue to the west and College Street to the south. An enclave surrounded by university grounds, Queen's Park, contains the Ontario Legislative Building and several historic monuments. With its green spaces and many interlocking courtyards, the university forms a distinct region of urban parkland in the city's downtown core. The namesake University Avenue is a ceremonial boulevard and arterial thoroughfare that runs through downtown between Queen's Park and Front Street. The Spadina, St. George, Museum, and Queen's Park stations of the Toronto subway system are nearby. The architecture is epitomized by a combination of Romanesque and Gothic Revival buildings spread across the eastern and central portions of campus, most dating between 1858 and 1929. The traditional heart of the university, known as Front Campus, is near the campus centre in an oval lawn enclosed by King's College Circle. The centrepiece is the main building of University College, built in 1857 with an eclectic blend of Richardsonian Romanesque and Norman architectural elements. The dramatic effect of this blended design by architect Frederick William Cumberland drew praise from European visitors of the time: "Until I reached Toronto," remarked Lord Dufferin during his visit in 1872, "I confess I was not aware that so magnificent a specimen of architecture existed upon the American continent." The building was declared a National Historic Site of Canada in 1968. Built in 1907, Convocation Hall is recognizable for its domed roof and Ionic-pillared rotunda. Although its foremost function is hosting the annual convocation ceremonies, the building is a venue for academic and social events throughout the year. The sandstone buildings of Knox College epitomizes the North American collegiate Gothic design, with its characteristic cloisters surrounding a secluded courtyard. The neoclassical Convocation Hall is characterized by its domed roof and Ionic-pillared rotunda. A lawn at the northeast is anchored by Hart House, a Gothic-revival student centre complex. Among its many common rooms, the building's Great Hall is noted for large stained-glass windows and a long quotation from John Milton's Areopagitica inscribed around the walls. The adjacent Soldiers' Tower stands 143 feet (44 m) tall as the most prominent structure in the vicinity, its stone arches etched with the names of university members lost to the battlefields of the two World Wars. The tower houses a 51-bell carillon played on special occasions such as Remembrance Day and convocation. North of University College, the main building of Trinity College displays Jacobethan Tudor architecture, while its chapel was built in the Perpendicular Gothic style of Giles Gilbert Scott. The chapel features exterior walls of sandstone and interiors of Indiana Limestone and was built by Italian stonemasons using ancient building methods. Philosopher's Walk is a scenic footpath that follows a meandering, wooded ravine, the buried Taddle Creek, linking with Trinity College, Varsity Arena and the Faculty of Law. Victoria College is on the eastern side of Queen's Park, centred on a Romanesque main building made of contrasting red sandstone and grey limestone. Developed after the Second World War, the western section of the campus consists mainly of modernist and internationalist structures that house laboratories and faculty offices. The most significant example of Brutalist architecture is the massive Robarts Library complex, built in 1972 and opened a year later in 1973. It features raised podia, extensive use of triangular geometric designs and a towering fourteen-storey concrete structure that cantilevers above a field of open space and mature trees. Sidney Smith Hall is the home to the Faculty of Arts and Science, as well as a few departments within the faculty. The Leslie L. Dan Pharmacy Building, completed in 2006, exhibits the high-tech architectural style of glass and steel by British architect Norman Foster. The University of Toronto has traditionally been a decentralized institution, with governing authority shared among its central administration, academic faculties and colleges. The Governing Council is the unicameral legislative organ of the central administration, overseeing general academic, business and institutional affairs. Before 1971, the university was governed under a bicameral system composed of the board of governors and the university senate. The chancellor, usually a former governor general, lieutenant governor, premier or diplomat, is the ceremonial head of the university. The president is appointed by the council as the chief executive. Unlike most North American institutions, the University of Toronto is a collegiate university with a model that resembles those of the University of Cambridge and the University of Oxford in Britain. The colleges hold substantial autonomy over admissions, scholarships, programs and other academic and financial affairs, in addition to the housing and social duties of typical residential colleges. The system emerged in the 19th century, as ecclesiastical colleges considered various forms of union with the University of Toronto to ensure their viability. The desire to preserve religious traditions in a secular institution resulted in the federative collegiate model that came to characterize the university. The Chapel of Trinity College reflects the college's Anglican heritage. University College was the founding nondenominational college, created in 1853 after the university was secularized. Knox College, a Presbyterian institution, and Wycliffe College, a low church seminary, both encouraged their students to study for non-divinity degrees at University College. In 1885, they entered a formal affiliation with the University of Toronto, and became federated schools in 1890. The idea of federation initially met strong opposition at Victoria University, a Methodist school in Cobourg, but a financial incentive in 1890 convinced the school to join. Decades after the death of John Strachan, the Anglican seminary Trinity College entered federation in 1904, followed in 1910 by St. Michael's College, a Roman Catholic college founded by the Basilian Fathers. Among the institutions that had considered federation but ultimately remained independent were McMaster University, a Baptist school that later moved to Hamilton, and Queen's College, a Presbyterian school in Kingston that later became Queen's University. The post-war era saw the creation of New College in 1962, Innis College in 1964 and Woodsworth College in 1974, all of them nondenominational. 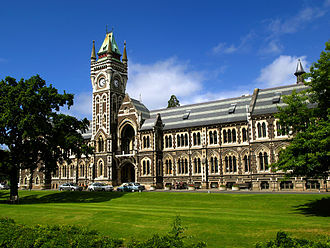 Along with University College, they comprise the university's constituent colleges, which are established and funded by the central administration and are therefore financially dependent. Massey College was established in 1963 by the Massey Foundation as a college exclusively for graduate students. Regis College, a Jesuit seminary, entered federation with the university in 1979. In contrast with the constituent colleges, the colleges of Knox, Massey, Regis, St. Michael's, Trinity, Victoria and Wycliffe continue to exist as legally distinct entities, each possessing a separate financial endowment. 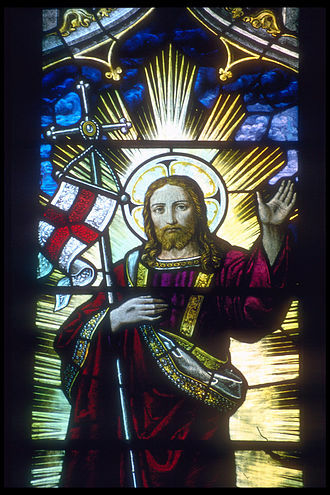 While St. Michael's, Trinity and Victoria continue to recognize their religious affiliations and heritage, they have since adopted secular policies of enrolment and teaching in non-divinity subjects. Some colleges have, or once had, collegiate structures of their own: Emmanuel College is a college of Victoria and St. Hilda's College is part of Trinity; St. Joseph's College had existed as a college within St. Michael's until it was dissolved in 2006. 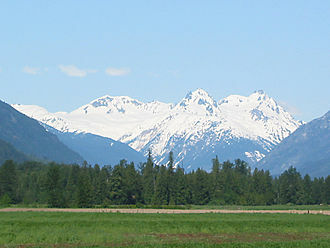 Ewart College existed as an affiliated college until 1991, when it was merged into Knox College. Postgraduate theology degrees are conferred by the colleges of Knox, Regis and Wycliffe, along with the divinity faculties within Emmanuel, St. Michael's and Trinity, including joint degrees with the university through the Toronto School of Theology. The Faculty of Arts and Science is the university's main undergraduate faculty, and administers most of the courses in the college system. While the colleges are not entirely responsible for teaching duties, most of them house specialized academic programs and lecture series. Among other subjects, Trinity College is associated with programs in international relations, as are University College with Canadian studies, Victoria College with Renaissance studies, Innis College with film studies and urban studies, New College with gender studies, Woodsworth College with industrial relations and St. Michael's College with Medievalism. The faculty teaches undergraduate commerce in collaboration with the Rotman School of Management. The Faculty of Applied Science and Engineering is the other major direct-entry undergraduate faculty. The University of Toronto is the birthplace of an influential school of thought on communication theory and literary criticism known as the Toronto School. Described as "the theory of the primacy of communication in the structuring of human cultures and the structuring of the human mind", the school is rooted in the works of Eric A. Havelock and Harold Innis and the subsequent contributions of Edmund Snow Carpenter, Northrop Frye and Marshall McLuhan. Since 1963, the McLuhan Program in Culture and Technology of the Faculty of Information has carried the mandate for teaching and advancing the Toronto School. The Sandford Fleming Building contains offices of the Faculty of Applied Science and Engineering. Several notable works in arts and humanities are based at the university, including the Dictionary of Canadian Biography since 1959 and the Collected Works of Erasmus since 1969. The Records of Early English Drama collects and edits the surviving documentary evidence of dramatic arts in pre-Puritan England, while the Dictionary of Old English compiles the early vocabulary of the English language from the Anglo-Saxon period. The Munk School of Global Affairs encompasses the university's various programs and curricula in international affairs and foreign policy. As the Cold War heightened, Toronto's Slavic studies program evolved into an important institution on Soviet politics and economics, financed by the Rockefeller, Ford and Mellon foundations. The Munk School is also home to the G20 Research Group, which conducts independent monitoring and analysis on the Group of Twenty, and the Citizen Lab, which conducts research on Internet censorship as a joint founder of the OpenNet Initiative. The university operates international offices in Berlin, Hong Kong and Siena. The Dalla Lana School of Public Health is a Faculty of the University of Toronto that began as one of the Schools of Hygiene begun by the Rockefeller Foundation in 1927. The School went through a dramatic renaissance after the 2003 SARS crisis, and it is now Canada's largest public health school, with more than 750 faculty, 800 students, and research and training partnerships with institutions throughout Toronto and the world. With more than $39 million in research funding per year, the School supports discovery in global health, tobacco impacts on health, occupational disease and disability, air pollution, inner city, circumpolar health, and many other pressing issues in population health. The Faculty of Medicine is affiliated with a network of ten teaching hospitals, providing medical treatment, research and advisory services to patients and clients from Canada and abroad. A core member of the network is University Health Network, itself a specialized federation of Toronto General Hospital, Princess Margaret Cancer Centre, Toronto Western Hospital, and Toronto Rehabilitation Institute. Physicians in the medical institutes have cross-appointments to faculty and supervisory positions in university departments. The Rotman School of Management developed the discipline and methodology of integrative thinking, upon which the school bases its curriculum. Founded in 1887, the Faculty of Law's emphasis on formal teachings of liberal arts and legal theory was then considered unconventional, but gradually helped shift the country's legal education system away from the apprenticeship model that prevailed until the mid-20th century. The Ontario Institute for Studies in Education is the teachers college of the university, affiliated with its two laboratory schools, the Institute of Child Study and the University of Toronto Schools, the lattermost of which is a private high school run by the university. Autonomous institutes at the university include the Canadian Institute for Theoretical Astrophysics, the Pontifical Institute of Mediaeval Studies and the Fields Institute. Robarts Library houses the university's main collection for humanities and social sciences. The University of Toronto Libraries is the third-largest academic library system in North America, following those of Harvard and Yale, measured by number of volumes held. The collections include more than ten million bound volumes, 5.4 million microfilms, 70,000 serial titles and one million maps, films, graphics and sound recordings. The largest of the libraries, Robarts Library, holds about five million bound volumes that form the main collection for humanities and social sciences. The Thomas Fisher Rare Book Library constitutes one of the largest repositories of publicly accessible rare books and manuscripts. Its collections range from ancient Egyptian papyri to incunabula and libretti; the subjects of focus include British, Western and Canadian literature, Aristotle, Darwin, the Spanish Civil War, the history of science and medicine, Canadiana and the history of books. Most of the remaining holdings are dispersed at departmental and faculty libraries, in addition to about 1.3 million bound volumes the colleges hold. The university has collaborated with the Internet Archive since 2005 to digitize some of its library holdings. Housed within University College, the University of Toronto Art Centre contains three major art collections. The Malcove Collection is primarily represented by Early Christian and Byzantine sculptures, bronzeware, furniture, icons and liturgical items. It also includes glassware and stone reliefs from the Greco-Roman period, and the painting Adam and Eve by Lucas Cranach the Elder, dated from 1538. The University of Toronto Collection features Canadian contemporary art, while the University College Art Collection holds significant works by the Group of Seven and 19th century landscape artists. The University of Toronto has ranked in a number of post-secondary rankings. In the 2018 Academic Ranking of World Universities rankings, the university ranked 23rd in the world and first in Canada. The 2019 QS World University Rankings ranked the university 21st in the world, and first in Canada. The 2019 Times Higher Education World University Rankings ranked the university 28th in the world, and first in Canada. In the 2019 U.S. News & World Report Best Global University Ranking, the university ranked 20th in the world, and first in Canada. The Canadian-based Maclean's magazine ranked the University of Toronto first in their 2019 Canadian Medical Doctoral university category. The university was ranked in spite of having opted out — along with several other universities in Canada — of participating in Maclean's graduate survey since 2006. The university's research performance has been noted in several bibliometric university rankings, which uses citation analysis to evaluates the impact a university has on academic publications. In 2018, the Performance Ranking of Scientific Papers for World Universities ranked the university fourth in the world, and first in Canada. The University Ranking by Academic Performance 2018–19 rankings placed the university second in the world, and first in Canada. Along with academic and research-based rankings, the university has also been ranked by publications that evaluate the employment prospects of its' graduates. In the Times Higher Education's 2018 global employability ranking, the university ranked 13th in the world, and first in Canada. In QS's 2019 graduate employability ranking, the university ranked 12th in the world, and first in Canada. In a 2013 employment survey conducted by the New York Times, the University of Toronto was ranked 14th in the world. In 2018, the University of Toronto Entrepreneurship was ranked the fourth best university-based incubator in the world by UBI Global in the "World Top Business Incubator – Managed by a University" category. Since 1926, the University of Toronto has been a member of the Association of American Universities, a consortium of the leading North American research universities. The university manages by far the largest annual research budget of any university in Canada, with sponsored direct-cost expenditures of $878 million in 2010. In 2018, the University of Toronto was named the top research university in Canada by Research Infosource, with a sponsored research income (external sources of funding) of $1,147.584 million in 2017. In the same year, the university's faculty averaged a sponsored research income of $428,200, while graduate students averaged a sponsored research income of $63,700. The federal government was the largest source of funding, with grants from the Canadian Institutes of Health Research, the Natural Sciences and Engineering Research Council and the Social Sciences and Humanities Research Council amounting to about one-third of the research budget. About eight percent of research funding came from corporations, mostly in the healthcare industry. The first practical electron microscope was built by the physics department in 1938. During World War II, the university developed the G-suit, a life-saving garment worn by Allied fighter plane pilots, later adopted for use by astronauts. Development of the infrared chemiluminescence technique improved analyses of energy behaviours in chemical reactions. In 1963, the asteroid 2104 Toronto is discovered in the David Dunlap Observatory in Richmond Hill and is named after the university. 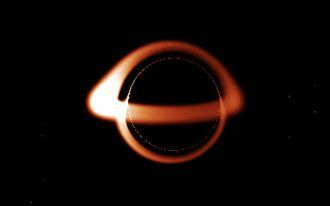 In 1972, studies on Cygnus X-1 led to the publication of the first observational evidence proving the existence of black holes. Toronto astronomers have also discovered the Uranian moons of Caliban and Sycorax, the dwarf galaxies of Andromeda I, II and III, and the supernova SN 1987A. A pioneer in computing technology, the university designed and built UTEC, one of the world's first operational computers, and later purchased Ferut, the second commercial computer after UNIVAC I. Multi-touch technology was developed at Toronto, with applications ranging from handheld devices to collaboration walls. The AeroVelo Atlas, which won the Igor I. Sikorsky Human Powered Helicopter Competition in 2013, was developed by the university's team of students and graduates and was tested in Vaughan. The discovery of stem cells by McCulloch and Till is the basis for all modern stem cell research. The discovery of insulin at the University of Toronto in 1921 is considered among the most significant events in the history of medicine. The stem cell was discovered at the university in 1963, forming the basis for bone marrow transplantation and all subsequent research on adult and embryonic stem cells. This was the first of many findings at Toronto relating to stem cells, including the identification of pancreatic and retinal stem cells. The cancer stem cell was first identified in 1997 by Toronto researchers, who have since found stem cell associations in leukemia, brain tumors and colorectal cancer. Medical inventions developed at Toronto include the glycaemic index, the infant cereal Pablum, the use of protective hypothermia in open heart surgery and the first artificial cardiac pacemaker. The first successful single-lung transplant was performed at Toronto in 1981, followed by the first nerve transplant in 1988, and the first double-lung transplant in 1989. Researchers identified the maturation promoting factor that regulates cell division, and discovered the T-cell receptor, which triggers responses of the immune system. The university is credited with isolating the genes that cause Fanconi anemia, cystic fibrosis and early-onset Alzheimer's disease, among numerous other diseases. Between 1914 and 1972, the university operated the Connaught Medical Research Laboratories, now part of the pharmaceutical corporation Sanofi-Aventis. Among the research conducted at the laboratory was the development of gel electrophoresis. The Donnelly Centre is part of the Discovery District, one of the world's largest biotechnology research clusters. The University of Toronto is the primary research presence that supports one of the world's largest concentrations of biotechnology firms. More than 5,000 principal investigators reside within 2 kilometres (1.2 mi) from the university grounds in Toronto's Discovery District, conducting $1 billion of medical research annually. MaRS Discovery District is a research park that serves commercial enterprises and the university's technology transfer ventures. 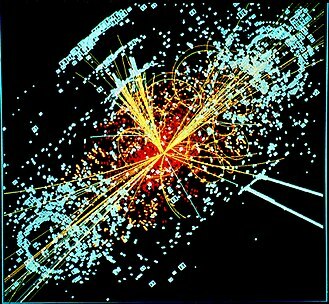 In 2008, the university disclosed 159 inventions and had 114 active start-up companies. Its SciNet Consortium operates the most powerful supercomputer in Canada. The 43 sports teams of the Varsity Blues represent the university in intercollegiate competitions. The two main leagues in which the Blues participate are U Sports (formerly known as Canadian Interuniversity Sport (CIS)) for national competitions and the auxiliary Ontario University Athletics conference at the provincial level. The athletic nickname of Varsity Blues was not consistently used until the 1930s; previously, references such as "Varsity", "The Big Blue", "The Blue and White" and "The Varsity Blue" also appeared interchangeably. The Blue and White is commonly played and sung in athletic games as a fight song. The University of Toronto Rowing Club trains in Toronto Harbour for the 1924 Summer Olympics. The team won silver for Canada. North American (gridiron) football traces its very origin to the University of Toronto with the first documented football game played at University College on November 9, 1861. The Blues played their first intercollegiate football match in 1877 against the University of Michigan in a game that ended with a scoreless draw. Since intercollegiate seasons began in 1898, the Blues have won four Grey Cup, two Vanier Cup and 25 Yates Cup championships, including the inaugural championships for all three trophies. However, the football team has hit a rough patch following its last championship in 1993. From 2001 until 2008, the Blues suffered the longest losing streak in Canadian collegiate history, recording 49 consecutive winless games. This was preceded by a single victory in 2001 that ended a run of 18 straight losses. The site of Varsity Stadium has served as the primary playing grounds of the Varsity Blues football and soccer programs since 1898. It also served as the venue for archery during the 2015 Pan American Games. Formed in 1891, the storied Varsity Blues men's ice hockey team has left many legacies on the national, professional and international hockey scenes. Conn Smythe played for the Blues as a centre during his undergraduate years, and was a Blues coach from 1923 to 1926. When Smythe took over the Toronto Maple Leafs in 1927, his new team adopted the Varsity Blue's familiar blue-and-white sweater design. 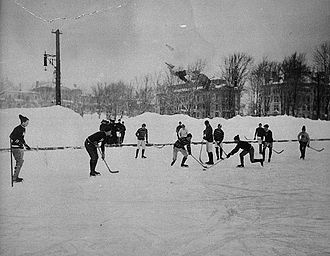 Blues hockey competed at the 1928 Winter Olympics and captured the gold medal for Canada. At the 1980 Winter Olympics, Blues coach Tom Watt served as co-coach of the Canadian hockey team in which six players were Varsity grads. In all, the Blues have won the U Sports University Cup national hockey title ten times, last in 1984. Varsity Arena has been the permanent home of the Blues ice hockey programs since it opened in 1926. In men's basketball, the Varsity Blues have won 14 conference titles, including the inaugural championship in 1909, but have not won a national title. In swimming, the men's team has claimed the national crown 16 times since 1964, while the women's team has claimed the crown 14 times since 1970. Established in 1897, the University of Toronto Rowing Club is Canada's oldest collegiate rowing club. It earned a silver medal for the country in the 1924 Summer Olympics, finishing second to Yale's crew. The back campus of University College was used for field hockey during the 2015 Pan American Games and the field was renamed Pan Am/Parapan Am Fields for the duration of the Pan American Games. Generations of students have attended speeches, debates and concerts at Hart House. In the heart of social, cultural and recreational life at the University of Toronto lies Hart House, the sprawling neo-Gothic student activity centre that was conceived by alumnus-benefactor Vincent Massey and named for his grandfather Hart. Opened in 1919, the complex established a communitarian spirit in the university and its students, who at the time kept largely within their own colleges under the decentralized collegiate system. At Hart House, a student can read in the library, dine casually or formally, have a haircut, visit the art gallery, watch a play in the theatre, listen to a concert, observe or join in debates, play billiards, or go for a swim and find a place to study, all under the same roof and within the span of a day. The confluence of assorted functions is the result of a deliberate effort to create a holistic educational experience, a goal summarized in the Founders' Prayer. The Hart House model was influential in the planning of student centres at other universities, notably Cornell University's Willard Straight Hall. Hart House resembles some traditional aspects of student representation through its financial support of student clubs, and its standing committees and board of stewards that are composed mostly of undergraduate students. However, the main students' unions on administrative and policy issues are the University of Toronto Students' Union, Association of Part-time Undergraduate Students and the Graduate Students' Union. Student representative bodies also exist at the various colleges, academic faculties and departments. The Hart House Debating Club employs a debating style that combines the American emphasis on analysis and the British use of wit. Smaller debating societies at Trinity, University and Victoria College have served as initial training grounds for debaters who later progress to Hart House. The club won the World Universities Debating Championship in 1981 and 2006. The North American Model United Nations (NAMUN) hosts an annual Model United Nations conference on campus, while the United Nations Society participates in various North American and international conferences. The Toronto chess team has captured the top title six times at the Pan American Intercollegiate Team Chess Championship. The Formula SAE Racing Team won the Formula Student European Championships in 2003, 2005 and 2006. The University of Toronto is home to the first collegiate fraternity in Canada, Zeta Psi, whose Toronto chapter has been active since 1879. Other fraternity chapters at the University of Toronto include Alpha Delta Phi, Alpha Epsilon Pi, Delta Kappa Epsilon, Sigma Chi, Delta Upsilon, Phi Delta Theta, Phi Kappa Sigma, Phi Gamma Delta, Psi Upsilon, Beta Theta Pi, Phi Kappa Pi, Kappa Sigma, Lambda Phi Epsilon, Sigma Nu, Theta Delta Chi, Alpha Kappa Nu, Alpha Omicron Pi, Delta Delta Delta, Pi Beta Phi and Lambda Chi Alpha. Other Greek-letter societies include Alpha Gamma Delta, Alpha Phi, Alpha Sigma Nu, Delta Phi Nu, Gamma Phi Beta, Kappa Alpha Society, Delta Psi Delta, Gamma Delta Nu, Kappa Phi Xi, Delta Pi, Chi Sigma Xi, Zeta Beta Omega, Kappa Kappa Gamma, and alpha Kappa Delta Phi. A secret society known as Episkopon has operated from Trinity College since 1858. Sunlight fills Knox College Chapel during a Christmas concert of the engineering faculty's Skule Choir. Hart House Theatre is the university's student amateur theatre, generally producing four major plays every season. As old as Hart House itself, the theatre is considered a pioneer in Canadian theatre for introducing the Little Theatre Movement from Europe. It has cultivated numerous performing-arts talents, including Donald Sutherland, Lorne Michaels, Wayne and Shuster and William Hutt. Three members of the Group of Seven painters (Harris, Lismer and MacDonald) have been set designers at the theatre, and composer Healey Willan was director of music for fourteen productions. The theatre also hosts annual variety shows run by several student theatrical companies at the colleges and academic faculties, the most prominent of which are U.C. Follies of University College, Skule Nite of the Faculty of Engineering, and Daffydil of the Faculty of Medicine, the latter in its hundredth year of production in 2010–2011. The main musical ensembles at Hart House are the orchestra, the chamber strings, the chorus, the jazz choir, the jazz ensemble and the symphonic band. The Jazz at Oscar's concert series performs big band and vocal jazz on Friday nights at the period lounge and bar of the Hart House Arbor Room. Open Stage is the monthly open mic event featuring singers, comics, poets and storytellers. The Sunday Concert is the oldest musical series at Hart House; since 1922, the series has performed more than 600 classical music concerts in the Great Hall, freely attended by the university community and general audiences. The public may also screen midday events held at noon, when concerts are recited prior to formal debut. William Lyon Mackenzie King was active in student media during his undergraduate years. The Varsity is one of Canada's oldest student-run newspapers in publication since 1880. The paper was originally a daily broadsheet, but has since adopted a compact format and is now weekly during the Fall and Winter semesters. It publishes online in the summer. Hart House Review, a literary magazine, publishes prose, poetry, and visual art from emerging Canadian writers and artists. The Newspaper is an independent student-run community newspaper, published weekly since 1978. CIUT-FM is the university's campus radio station, while the University of Toronto Television broadcasts student-produced content. Students at each college and academic faculty also produce their own set of journals and news publications. University College's The Gargoyle was an early training ground for such notables as journalist Naomi Klein, and musician/comedian Paul Shaffer. Victoria University's Acta Victoriana is the oldest active literary journal in Canada, and provided first publication credits to such literary figures as Margaret Atwood and Northrop Frye. Members of the student press have contributed to activist causes on several notable occasions. At the height of debate on coeducation in 1880, The Varsity published an article in its inaugural issue voicing in favour of admitting women. In 1895, the university suspended the editor of The Varsity for breach of collegiality, after he published a letter that harshly criticized the provincial government's dismissal of a professor and involvement in academic affairs. 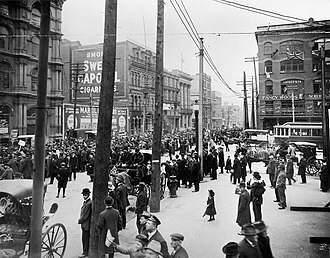 University College students then approved a motion by Varsity staff member and future Prime Minister William Lyon Mackenzie King and boycotted lectures for a week. After Prime Minister Pierre Trudeau decriminalized homosexuality throughout Canada in 1969, a medical research assistant placed an advertisement in The Varsity seeking volunteers to establish the first university homophile association in Canada. Teefy House, a residence hall of St. Michael's College, is home to female first-year undergraduate students. Each college at the University of Toronto operates its own set of residence halls and dining halls clustered in a different area of the campus. Innis, New, St. Michael's, Trinity, University, Victoria, and Woodsworth colleges reserve most of their dormitories for their undergraduate students within the Faculty of Arts and Science, while setting a portion available to students from the professional and postgraduate faculties. Massey College is exclusively for graduate students, while Knox and Wycliffe Colleges mainly house graduate theology students. Annesley Hall of Victoria College, a National Historic Site, was the first university residence for women in Canada. After St. Hilda's College became coeducational in 2005, Annesley Hall and Loretto College of St. Michael's College are the last remaining women's halls at the university. As campus residences accommodate just 6,400 students in all, the university guarantees housing only for undergraduates in their first year of study, while most upper-year and graduate students reside off-campus. Traditionally, the adjacent neighbourhoods of The Annex and Harbord Village are popular settling grounds for University of Toronto students, forming a distinct student quarter enclave. In 2004, the university purchased and converted a nearby hotel in Little Japan to the south into the Chestnut Residence, which houses students from all colleges and faculties. There are also numerous fraternity houses and student housing cooperatives, where boarders pay reduced rent for assuming housekeeping duties. The University of Toronto is known for having a high enrollment of international students. In 2016–17, 19.7% of students were international. The University plans to grow its international enrollment to 20.1% by 2021–22. In 2017, the University of Toronto had more international students enrolled than all other Canadian post-secondary institutions. In 2001–02, the overall gender ratio was about 57.1% female to 42.9% male for enrolled students, or about 15 males for every 20 females. This gender gap has improved slightly in recent years to 55.8% female and 44.2% male, or about 16 males for every 20 females in 2014–15 (non-binary genders were not reported). This gap is more pronounced for graduation rates, with 59% of degrees conferred on females. Gender ratios also depend on undergraduate versus graduate enrollment, and department. The overall average of high school grades for first year students was about 86% for fall 2014. The retention rate was 92.1%. In 2011–12, 40.3% of the students were enrolled in the Social Science and Humanities departments, 23.9% were enrolled in Biology, Engineering, and Mathematics & Physical Sciences. General education accounted for 14.7% enrollment (all undergraduates). Health Professions was 12.7%, Education 5.8%, and Fine Arts 2.6%. In addition to Havelock, Innis, Frye, Carpenter and McLuhan, former professors of the 20th century include Frederick Banting, Harold Scott MacDonald Coxeter, Robertson Davies, John Charles Fields, Leopold Infeld and C. B. Macpherson. Ten Nobel laureates studied or taught at the University of Toronto. As of 2006, University of Toronto academics accounted for 15 of 23 Canadian members in the American Academy of Arts and Sciences (65%) and 20 of 72 Canadian fellows in the American Association for the Advancement of Science (28%). Among honorees from Canada between 1980 and 2006, University of Toronto faculty made up 11 of 21 Gairdner Foundation International Award recipients (52%), 44 of 101 Guggenheim Fellows (44%), 16 of 38 Royal Society fellows (42%), 10 of 28 members in the United States National Academies (36%) and 23 of 77 Sloan Research Fellows (30%). Alumni of the University of Toronto's colleges, faculties and professional schools have assumed notable roles in a wide range of fields and specialties. In government, Governors General Vincent Massey and Adrienne Clarkson, Prime Ministers William Lyon Mackenzie King, Arthur Meighen, Lester B. Pearson and Paul Martin, and 14 Justices of the Supreme Court have all graduated from the university, while world leaders include President of Latvia Vaira Vīķe-Freiberga, Premier of the Republic of China Liu Chao-shiuan and President of Trinidad and Tobago Noor Hassanali. Economist John Kenneth Galbraith, political scientist David Easton, historian Margaret MacMillan, philosophers David Gauthier and Ted Honderich, anthropologist Davidson Black, social activist Ellen Pence, sociologist Erving Goffman, psychologists Endel Tulving, Daniel Schacter, and Lisa Feldman Barrett, physicians Norman Bethune and Charles Best, geologists Joseph Tyrrell and John Tuzo Wilson, mathematicians Irving Kaplansky and William Kahan, physicists Arthur Leonard Schawlow and Bertram Brockhouse, religion scholar Amir Hussain, architect James W. Strutt, engineer Gerald Bull, computer scientists Alfred Aho and Brian Kernighan, and astronauts Roberta Bondar and Julie Payette are also some of the most well-known academic figures from the university. 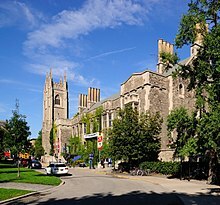 In business, University of Toronto alumni include Rogers Communications' Ted Rogers, Toronto–Dominion Bank's W. Edmund Clark, Bank of Montreal's Bill Downe, Scotiabank's Peter Godsoe, Barrick Gold's Peter Munk, BlackBerry's Jim Balsillie, AGF's Blake Goldring eBay's Jeffrey Skoll, Fiat S.p.A.'s Sergio Marchionne, and Apotex's Bernard Sherman. In literature and media, the university has produced writers Stephen Leacock, John McCrae, Rohinton Mistry, Margaret Atwood and Michael Ondaatje, film directors Arthur Hiller, Norman Jewison, David Cronenberg and Atom Egoyan, actor Donald Sutherland, screenwriter David Shore, television producer and writer Hart Hanson, musician Paul Shaffer, journalists Malcolm Gladwell, Naomi Klein and Barbara Amiel. ^ Originates from Horace Odes, book I, ode 12, line 45: "crescit occulto velut arbor ævo fama Marcelli" ("The fame of Marcellus grows like a tree over time unseen"). ^ a b Endowment figure does not include separate endowment funds maintained by individual colleges. Financial Report - 2017 (PDF). Financial Services Department, University of Toronto. 2017. ^ a b "About The Chancellor". Retrieved August 17, 2018. ^ a b c d e f Main campus FTE figures. For data on Scarborough and Mississauga, refer to the respective articles. Pask-Aubé, Corinne (2012). University of Toronto Facts and Figures. Office of Government, Institutional and Community Relations. ^ a b c "Quick Facts". University of Toronto. Retrieved 2018-10-12. ^ "Association of American Universities". Aau.edu. Archived from the original on January 14, 2013. Retrieved November 5, 2012. ^ "Simcoe, John Graves". Volume V. Dictionary of Canadian Biography. 2000. Retrieved November 2, 2008. ^ a b "The story of the University of Toronto's original charter". University of Toronto Archives and Records Management Services. Archived from the original on July 10, 2012. Retrieved November 2, 2008. ^ a b c d e f g Friedland, Martin L. (2002). The University of Toronto: A History. University of Toronto Press. pp. 4, 31, 143, 156, 313, 376, 593–6. ISBN 978-0-8020-4429-7. ^ Peppiatt, Liam. "Chapter 17: Universities Old and New". Robertson's Landmarks of Toronto Revisited. ^ "Strachan, John". Volume IX. Dictionary of Canadian Biography Online. 2000. Retrieved November 2, 2008. ^ Faught, Brad (2000). "The Cast of Presidents". University of Toronto Magazine (Summer 2000). ^ Dickson, Lovat (1986). The Museum Makers: the Story of the Royal Ontario Museum. University of Toronto Press. ISBN 978-0-8020-7441-6. ^ Schabas, Ezra (2005). There's Music in These Walls: A History of the Royal Conservatory of Music. Dundurn Press Ltd. ISBN 978-1-55002-540-8. ^ Parker, George L. (2009). "University Presses". The Canadian Encyclopedia. Historica Foundation of Canada. ^ Russel, C. H. (February 1999). "The Legacy Continues:C. A. Chant and the David Dunlap Observatory". 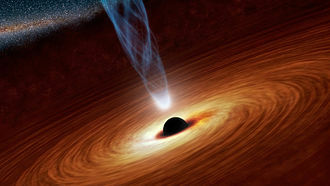 Journal of the Royal Astronomical Society of Canada. 93 (1). ^ "Canadian university endowment funds skyrocket". Ottawa Citizen. CanWest Global. October 26, 2007. Archived from the original on October 27, 2007. Retrieved March 13, 2009. ^ a b c Allsop, Robert; et al. (1999). "Investing in the Landscape". —. The Open Space Steering Committee, University of Toronto. Archived from the original on July 28, 2009. Retrieved January 11, 2009. ^ Timperlake, J. (1877). Illustrated Toronto, Past and Present. Toronto: Peter A. Gross. p. 209. ^ Simmins, Geoffrey (1997). Fred Cumberland: Building the Victorian Dream. University of Toronto Press. p. 92. ISBN 978-0-8020-0679-0. ^ Minutes of the Historic Sites and Monuments Board of Canada. National Historic Sites Directorate. 1968. Fed/Prov/Terr identifier 558. ^ Duffy, Dennis (2002). "As Canadian as a Snowflake". University of Toronto Magazine (Spring 2002). Retrieved January 11, 2009. ^ a b Fraser, Brian J. (1995). Church, College, and Clergy: A History of Theological Education at Knox College, Toronto, 1844–1994. McGill-Queen's University Press. p. 126. ISBN 978-0-7735-1351-8. ^ Kilgour, David (1999). 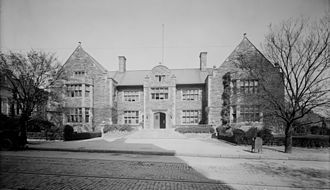 A Strange Elation: Hart House, The First Eighty Years. Toronto: Hart House. ISBN 978-0-7727-0649-2. ^ Colombo, John Robert (1984). Canadian Literary Landmarks. Dundurn Press Ltd. p. 194. ISBN 978-0-88882-073-0. ^ "Soldiers' Tower Committee Information". Soldiers' Tower Committee, University of Toronto. Archived from the original on February 24, 2009. Retrieved March 15, 2009. ^ Leeper, Muriel (1998). "Ringing the bells – Carillon demonstration by musician Gerald Martindale at the Soldiers' Tower Carillon at the University of Toronto in Canada". Performing Arts & Entertainment in Canada. 32 (1). ISSN 1185-3433. ^ Arthur, Eric Ross; Otto, Stephen A. (1986). Toronto, No Mean City. University of Toronto Press. p. 130. ISBN 978-0-8020-6587-2. ^ "Trinity College Chapel". University of Trinity College. ^ Houghton, Sarah (March 12, 2003). "One Hundred Years of Architecture". The Strand. Archived from the original on September 15, 2007. Retrieved March 15, 2009. ^ McClelland, Michael; Stewart, Graeme; E.R.A. Architects (2007). Concrete Toronto: A Guidebook to Concrete Architecture from the Fifties to the Seventies. Coach House Books. pp. 34, 164, 173. ISBN 978-1-55245-193-9. ^ McKeough, Tim (2007). "The Leslie L. Dan Pharmacy Building, Toronto". Architectural Record (May 2007). Retrieved March 14, 2009. ^ a b Ross, Murray G. (April 1972). "The dilution of academic power in Canada: The University of Toronto Act". Minerva. Springer Netherlands. 10 (2): 242–258. doi:10.1007/BF01682420. ^ a b c Alexander, William John (1906). The University of Toronto and Its Colleges, 1827–1906. Toronto: H. H. Langton, The University Library. ^ "History & Mission". Wycliffe College. 2008. Retrieved December 27, 2008. ^ a b "Historical Background". University of Trinity College. 2008. Archived from the original on January 29, 2009. Retrieved December 27, 2008. ^ a b "About St Mike's: Our History". St. Michael's College. 2008. Archived from the original on February 26, 2009. Retrieved December 27, 2008. ^ "History: Campus & People". Queen's University. 2007. Archived from the original on July 6, 2011. Retrieved December 27, 2008. ^ "Introduction to New College". New College, University of Toronto. 2007. Archived from the original on February 21, 2009. Retrieved December 27, 2008. "About Innis College". Innis College, University of Toronto. 2005. Archived from the original on December 10, 2008. Retrieved December 27, 2008. "Mission and History". Woodsworth College, University of Toronto. 2006. Retrieved December 27, 2008. ^ Riggall, Catherine (2010). University of Toronto Financial Report (PDF). Office of the Vice-President, Business Affairs. Archived from the original (PDF) on July 6, 2011. Retrieved October 15, 2010. ^ a b "Funding for the Federated Universities: Policy and Procedures". University of Toronto. 1998 . Archived from the original (Memorandum) on August 2, 2008. Retrieved December 27, 2008. ^ "Massey College". Massey College. 2007. Archived from the original on February 19, 1999. Retrieved December 27, 2008. ^ "History of Regis College". Regis College. 2008. Retrieved December 27, 2008. ^ "The History of Victoria University and Emmanuel College" (PDF). Victoria University. 2004. Archived from the original (PDF) on February 5, 2009. Retrieved December 27, 2008. ^ "History". Knox College, University of Toronto. 2008. Archived from the original on December 9, 2008. Retrieved December 27, 2008. ^ "TST Member and Affiliate Schools with Location Information". Toronto School of Theology. 2008. Archived from the original on October 11, 2007. Retrieved December 27, 2008. ^ "A&S at a Glance". University of Toronto Faculty of Arts and Science. 2007. Archived from the original on June 17, 2008. Retrieved November 8, 2008. ^ "International Relations". Trinity College Programs. University of Trinity College. ; "Canadian Studies home". University College. Archived from the original on April 3, 2009. ; "The Renaissance Studies Program". Victoria College. Archived from the original on March 7, 2009. Retrieved March 15, 2009. ; "Innis Programs". Innis College. 2005. Archived from the original on December 3, 2013. Retrieved September 17, 2017. ; "Women and Gender Studies". New College. Archived from the original on February 26, 2009. ; "Mediaeval Studies". Undergraduate Studies. University of St. Michael's College. 2008. Archived from the original on March 24, 2012. Retrieved September 17, 2017. ^ "University of Toronto 2009–2010 Viewbook". University of Toronto. 2008. Retrieved January 12, 2009. ^ Logan, Robert K. (1986). The Alphabet Effect. New York: William Morrow and Company. p. 22. ISBN 978-0-312-00993-9. ^ Olson, David R. (1994). The World on Paper: The Conceptual and Cognitive Implications of Writing and Reading. Cambridge: Cambridge University Press. p. 15. ISBN 978-0-521-57558-4. ^ a b Murray, Oswyn. "The Word is Mightier than the Pen". The Times Literary Supplement. 4 (498): 655. ^ "History and Mandate". McLuhan Program in Culture and Technology. Archived from the original on September 21, 2003. Retrieved November 15, 2008. ^ "Outline of the Project". Dictionary of Canadian Biography. 2000. Archived from the original on March 10, 2009. Retrieved January 19, 2009. ^ Desiderius Erasmus (1969). Collected works of Erasmus: Vol. 1 – 78. Toronto: University of Toronto Press. ^ "What is REED?". Records of Early English Drama. Centre for Research in Early English Drama, University of Toronto. 2006. Retrieved January 19, 2009. ^ "About the Dictionary of Old English". Dictionary of Old English. Centre for Medieval Studies, University of Toronto. Retrieved January 19, 2009. ^ "Advanced Research Projects". Citizen Lab. 2004. Archived from the original on June 3, 2008. Retrieved November 20, 2008. ^ "Welcome to Psiphon". Citizen Lab. Retrieved November 20, 2008. ^ "University of Toronto International Centres". University of Toronto. 2009. Archived from the original on July 1, 2010. Retrieved September 1, 2010. ^ "Hospital Partners". Experience Research. Office of the Vice-President, Research, University of Toronto. 2008. Retrieved March 15, 2009. ^ "Toronto General Hospital". Archived from the original on October 5, 2006. Retrieved November 30, 2008. ; "Princess Margaret Hospital". Archived from the original on October 4, 2006. Retrieved November 30, 2008. ; "Toronto Western Hospital". University Health Network. Archived from the original on October 4, 2006. Retrieved November 30, 2008. ^ Srikant M. Datar; David A. Garvin; Patrick G. Cullen (2010). Rethinking the MBA: Business Education at a Crossroads. Boston: Harvard Business Press. pp. 131–136. ISBN 978-1-4221-3164-0. ^ Moore, Christopher (1997). The Law Society of Upper Canada and Ontario's lawyers, 1797–1997. Toronto: University of Toronto Press. pp. 237–262. ISBN 978-0-8020-4127-2. ^ "History and Function of OISE". Graduate Studies in Education Bulletin. Ontario Institute for Studies in Education. 2008. Retrieved March 15, 2009. ^ Kyrillidou, Martha; Morris, Shaneka; Roebuck, Gary (2012). ARL Statistics 2010–11. Washington, D.C.: Association of Research Libraries. ^ "Index to Collections, Manuscript Collections". Thomas Fisher Rare Book Library. Retrieved November 15, 2008. ^ "Book Collections". Thomas Fisher Rare Book Library. Retrieved November 15, 2008. ^ Kesmodel, David; Vara, Vauhini (November 9, 2005). "Building an Online Library, One Volume at a Time". The Wall Street Journal. ^ a b "Malcove Collection Objects List" (PDF). University of Toronto Art Centre. Retrieved December 13, 2008. ^ a b "University of Toronto and University College Collections" (PDF). University of Toronto Art Centre. Retrieved December 13, 2008. ^ "11 universities bail out of Maclean's survey". CBC News. Canadian Broadcasting Corporation. 14 April 2006. Retrieved 12 March 2019. ^ "Ready for the Job Market?". New York Times. The New York Times Company. October 28, 2013. Retrieved October 31, 2013. ^ Pelley, Lauren. "Ryerson, U of T, York startup launchpads ranked among top university business incubators, accelerators". CBC. CBC. Retrieved Feb 28, 2018. ^ Murray, Andrew. "REVEALED! The World's Top University-linked Business Incubators & Accelerators 17/18". UBI Global. Retrieved 6 March 2018. ^ "Canada's Top 50 Research Universities 2012" (PDF). Research Infosource Inc. 2011. Archived from the original (PDF) on March 24, 2012. Retrieved April 18, 2012. ^ a b c Challis, John R. G. (2006). "2005–2006 Annual Research Report" (PDF). Office of the Vice-President, Research and Associate Provost, University of Toronto. Archived from the original (PDF) on December 17, 2008. Retrieved November 16, 2008. ^ a b Young, R. Paul (2007). "2006–2007 Annual Research Report". Office of the Vice-President, Research and Associate Provost, University of Toronto. Archived from the original on May 21, 2011. Retrieved November 16, 2008. "By the Numbers" (PDF). Office of the Vice-President, Research and Associate Provost, University of Toronto. 2007. Archived from the original (PDF) on December 21, 2008. Retrieved December 19, 2008. ^ a b "Canada's Top 50 Research Universities 2018". Research Infosource. 2018. Retrieved 12 March 2019. ^ "James Hillier". Inventor of the Week. Massachusetts Institute of Technology. Retrieved November 20, 2008. ^ Pearce, Jeremy (January 22, 2007). "James Hillier, 91, Dies; Co-Developed Electron Microscope". The New York Times. Retrieved November 20, 2008. ^ Dotto, Lydia. "Canada's Aerospace Medicine Pioneers" (PDF). Canadian Space Agency. Retrieved November 20, 2008. ^ "The Nobel Prize in Chemistry 1986" (Press release). Nobel Foundation. October 15, 1986. Retrieved November 20, 2008. ^ "Canadian Asteroids". The Royal Astronomy Society of Canada. July 22, 2008. Archived from the original on February 1, 2009. Retrieved January 19, 2009. ^ Bolton, C. T. (1972). "Identification of Cygnus X-1 with HDE 226868". Nature. 235 (2): 271–273. Bibcode:1972Natur.235..271B. doi:10.1038/235271b0. ^ "Two New Moons Of Uranus Discovered". Science Daily. November 1, 1997. Retrieved November 20, 2008. ^ Williams, Michael R. (1994). "UTEC and Ferut: The University of Toronto's Computation Centre" (PDF). IEEE Annals of the History of Computing. 16 (2): 4. doi:10.1109/85.279226. Archived from the original (PDF) on July 13, 2004. Retrieved November 17, 2008. ^ Mehta, Nimish (1982). "A Flexible Machine Interface" (thesis). Department of Electrical Engineering, University of Toronto. ^ Buxton, Bill (August 22, 2008). "Multi-Touch Systems that I Have Known and Loved". Retrieved November 18, 2008. ^ Altman, Lawrence K. (September 14, 1982). "The Tumultuous Discovery of Insulin: Finally, Hidden Story Is Told". The New York Times. Retrieved November 23, 2008. ^ Cheng, Alice Y.Y. ; Zinman, Bernard (2002). "Insulin analogues and the treatment of diabetes". Diabetes: From Research to Diagnosis and Treatment. Informa Health Care. ISBN 978-1-84184-151-9. ^ Strauss, Evelyn (2005). "2005 Albert Lasker Basic Medical Research Award". Lasker Foundation. Retrieved November 23, 2008. ^ Seaberg, Raewyn M; Smukler, Simon R; Kieffer, Timothy J; Enikolopov, Grigori; Asghar, Zeenat; Wheeler, Michael B; Korbutt, Gregory; van der Kooy, Derek (August 22, 2004). "Clonal identification of multipotent precursors from adult mouse pancreas that generate neural and pancreatic lineages". Nature Biotechnology. 22 (9): 1115–1124. doi:10.1038/nbt1004. PMID 15322557. ^ Tropepe, V.; Coles, B.L. ; Chiasson, B.J. ; Horsford, D.J. ; Elia, A.J. ; McInnes, R.R. ; van der Kooy, D. (March 2000). "Retinal stem cells in the adult mammalian eye". Science. 287 (5460): 2032–6. Bibcode:2000Sci...287.2032T. doi:10.1126/science.287.5460.2032. PMID 10720333. ^ Park, Alice (April 17, 2006). "Stem Cells That Kill". Time. 167 (17). ^ Wade, Nicholas (February 21, 2006). "Stem Cells May Be Key to Cancer". The New York Times. Retrieved November 23, 2008. ^ Berman, Jessica (November 27, 2006). "Researchers Uncover Colon Cancer Stem Cells". Voice of America. Archived from the original on January 10, 2007. Retrieved November 23, 2008. ^ Jenkins, D. J.; et al. (1981). "Glycemic index of foods: a physiological basis for carbohydrate exchange". American Journal of Clinical Nutrition. 34 (3): 362–366. doi:10.1093/ajcn/34.3.362. ISSN 0002-9165. PMID 6259925. ^ "Dr. Alan Brown, Pediatrician, 73, One of Developers of Pablum Is Dead". The New York Times. September 9, 1960. ^ a b Pearce, Jeremy (March 31, 2005). "Dr. Wilfred G. Bigelow, 91, A Pioneer in Heart Surgery". The New York Times. Retrieved March 21, 2009. ^ Altman, Lawrence K. (May 2, 1999). "New Direction for Transplants Raises Hopes and Questions". The New York Times. Retrieved November 23, 2008. ^ "Understanding the cell cycle" (PDF). Lasker Foundation. October 1998. Archived from the original (PDF) on July 16, 2010. Retrieved February 10, 2010. ^ Strathdee, C.A. ; Gavish, H.; Shannon, W.; Buchwald, M. (1992). "Cloning of cDNAs for Fanconi's anemia by functional complementation". Nature. 356 (6372): 763–767. Bibcode:1992Natur.356..763S. doi:10.1038/356763a0. PMID 1574115. ^ "Oliver Smithies autobiography". Nobel Foundation. October 8, 2007. Retrieved November 22, 2008. ^ a b Kleiner, Kurt (May 8, 2008). "Toronto Rising" (PDF). Nature. 453 (7192): 252–253. doi:10.1038/nj7192-252a. 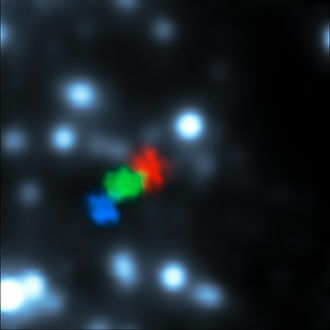 ISSN 1476-4687. PMID 18561361. Retrieved July 6, 2009. ^ El Akkad, Omar (June 20, 2009). "Canada's monster computer roars to life". Globe and Mail. Canada. Retrieved July 6, 2009. ^ a b c "Football 2008 Media Guide" (PDF). —. University of Toronto Varsity Blues. 2008. Archived from the original (PDF) on February 5, 2009. Retrieved December 13, 2008. ^ Rebecca Green (1990-10-09). "College Songs and Songbooks". Thecanadianencyclopedia.com. Retrieved 2012-11-16. ^ "Canada sets the international standard". IFAF Junior World Championship. USA Football. 2008. Retrieved December 13, 2008. ^ "Canadian Football Timelines (1860–present)". Football Canada. 2008. Archived from the original on March 29, 2008. Retrieved December 13, 2008. ^ a b c "Varsity Blues Men's Hockey 2008–2009" (PDF). University of Toronto Faculty of Physical Education and Health. 2008. Retrieved December 21, 2008. ^ "Smythe, Conn biography". Legends of Hockey. Hockey Hall of Fame. 2008. Archived from the original on February 6, 2005. Retrieved December 21, 2008. ^ "Varsity Blues Men's Basketball 2008–2009" (PDF). University of Toronto Faculty of Physical Education and Health. 2008. Retrieved December 21, 2008. ^ "CIS Swimming Championship History". Canadian Interuniversity Sport. 2008. Archived from the original on February 26, 2009. Retrieved December 21, 2008. ^ a b Okens, Patrick (1999). "Blues Before Sunrise: Rowing at the University of Toronto". University of Toronto Graduate Department of History. ^ McGregor, Nancy; Wardrop, Patricia; Winters, Kenneth. "Hart House". The Canadian Encyclopedia. Historica Foundation of Canada. ^ a b Faught, Brad (1999). "The House Is Where the Heart Is". University of Toronto Magazine (Autumn 1999). Retrieved February 28, 2009. ^ Brown, Gord (November 12, 2009). "Hart House Hair clips along for 90 years". the newspaper. Archived from the original on January 15, 2013. Retrieved November 15, 2012. ^ "The Founders' Prayer". Hart House. Archived from the original on November 22, 2007. Retrieved February 28, 2009. "... discover within its walls true education that is to be found within good fellowship, in friendly disputation and debate, in the conversation of wise and earnest men, in music, pictures and the play, in the casual book, in sports and games and the mastery of the body". ^ "Willard Straight Hall Student Union". Office of the Dean of Students, Cornell University. 2009. Retrieved February 28, 2009. As one of the United States first college unions, this Gothic structure was modeled after Hart House at the University of Toronto. ^ "Question 9". Dear Uncle Ezra. Cornell University. Retrieved February 28, 2009. The room itself is modeled after the University of Toronto's Hart House, the student union at U of T. The Memorial Room is a smaller version of the Great Hall in Hart House, which is about 3 times the size of the Straight and includes a large wing devoted to athletics. ^ a b Webb, Margaret (2003). "Fighting Words". University of Toronto Magazine (Summer 2003). Retrieved February 28, 2009. ^ Flynn, Colm (2006). "Dublin Worlds 2006". World Debate Website. Archived from the original on September 27, 2007. Retrieved September 24, 2007. ^ "UTMUN". University of Toronto Model United Nations. Retrieved April 28, 2011. ^ "United Nations Society". United Nations Society. Archived from the original on January 21, 2010. 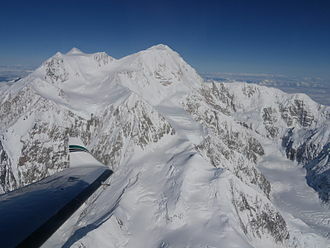 Retrieved March 11, 2010. ^ Weinstock, Ruth (July 16, 2006). "U of T Formula SAE team races to international victory". University of Toronto Department of Public Affairs. Archived from the original on September 22, 2007. Retrieved September 24, 2007. ^ "Breaking New Ground". The History of Zeta Psi. Zeta Psi Fraternity of North America. 2007. Retrieved February 28, 2009. ^ "Directory of Fraternities and Sororities". Canadians Go Greek!. Retrieved February 28, 2009. ^ "Delta Phi Nu Toronto". Archived from the original on 2014-12-13. ^ Banham, Martin (1995). The Cambridge Guide to Theatre. Cambridge University Press. p. 161. ISBN 978-0-521-43437-9. ^ Londré, Felicia Hardison; Watermeier, Daniel J. (1998). The History of North American Theater. Continuum International Publishing Group. p. 353. ISBN 978-0-8264-1079-5. ^ "Internuts". Daffydil 2009. University of Toronto Faculty of Medicine. 2009. Archived from the original on October 15, 2011. Retrieved February 25, 2009. ^ "Kicks for free: bargain activities". Toronto Life. Toronto: St. Joseph Communications. March 2003. ISSN 0049-4194. ^ "Rupert M. K. Schieder 1915–2008". Globe and Mail. Canada. September 5, 2008. ^ "Sunday Concert". Hart House Music Committee. 2008. Archived from the original on January 8, 2009. Retrieved February 25, 2009. ^ Marshall, David B. (2000). "Dale, William". Dictionary of Canadian Biography. Retrieved February 28, 2009. ^ Bébout, Rick (January 2000). "Conception & birth". On the Origins of the Body Politic. Retrieved February 28, 2009. ^ "Engineering, Music, and Phys. Ed. students". Student Housing Service, University of Toronto. 2008. Archived from the original on March 6, 2009. Retrieved March 29, 2009. ^ "The Residence Guarantee". Student Housing Service, University of Toronto. 2008. Archived from the original on August 5, 2009. Retrieved March 29, 2009. ^ Ley, David (1996). The New Middle Class and the Remaking of the Central City. Oxford University Press. p. 182. ISBN 978-0-19-823292-6. ^ Schackner, Bill (July 8, 2007). "For collegians in Canada, drinking is no big thing". Pittsburgh Post-Gazette. Retrieved March 29, 2009. ^ "Enrolment Report 2016-17" (PDF). University of Toronto Planning and Budget Office. 8 February 2017. Retrieved 29 October 2017. ^ Harris, Kathleen (3 September 2017). "Foreign students flock to Canada as government struggles to get grads to stay". CBCNews. Canadian Broadcasting Corporation. Retrieved 4 March 2018. ^ Xu, Xiao (27 September 2017). "Climbing number of foreign students puts B.C. university's cap system to the test". The Globe and Mail. The Woodbridge Company. Retrieved 4 March 2018. ^ "Common University Data Ontario 2017". University of Toronto. 2019. Retrieved 17 March 2019. ^ a b c Xuelun Liang (2012). "Facts & Figures 2012" (PDF). University of Toronto. Retrieved 29 October 2017. ^ a b "Common University Data Ontario 2015". University of Toronto. 2015. Archived from the original on November 8, 2017. Retrieved October 29, 2017. ^ "University of Toronto Alumni - Blake C Goldring". alumni.utoronto.ca. University of Toronto. Archived from the original on March 14, 2016. Retrieved June 20, 2016. The University of Toronto Mississauga is a satellite campus of the University of Toronto, located in Mississauga, Canada. UTM is set on the valley of the Credit River, approximately 33 km west of Downtown Toronto and it is the second-largest campus of the university in terms of enrollment. University of Toronto Mississauga was built on the estate of Reginald Watkins. Founded as Erindale College in 1965, construction of the Universitys main building began in 1966, although this building was originally meant to be temporary, the building remained until 2016 as part of the North Building. In 1998, Erindale assumed the name of University of Toronto Mississauga. In 2007, UTM celebrated its 40th anniversary, a milestone which was capped off with the opening of the Hazel McCallion Academic Learning Center on June 2,2007. The campus consists of a number of buildings arranged across a large, the surrounding suburban neighbourhood is a fairly affluent section of the city of Mississauga. 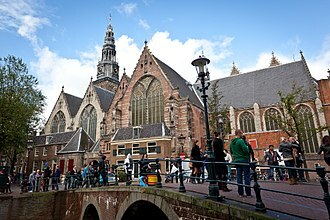 The largest building was built as a structure, predominantly out of concrete. It was one of architect Raymond Moriyamas first major commissions, other buildings were added over the decades, and with the enlarged enrollment at the beginning of the new millennium, the pace of construction increased. In September 2014, UTM opened Deerfield Hall, the first phase of the reconstruction of the North Building. It features four storeys with theatre rehearsal space, computer labs, offices and informal study space, the North Building Phase B—a 210, 000-square-foot, six-storey structure—is scheduled to open in summer 2018. A new CCT building, designed by Saucier + Perrot, was opened in September 2004 and it is characterized by a black and glass exterior. The interior is finished in concrete and gray paint, with black plastic melamine on many surfaces, the new library consists of four floors with a mixture of group study tables and individual silent study space. Students are provided with fully equipped student lounge and outdoor terrace to relax, students are able to share lectures and leaning experiences both inside and outside the classroom through advanced technologies. The new province remained, for the next fifty years of growth and settlement, the colonial government of the territory. 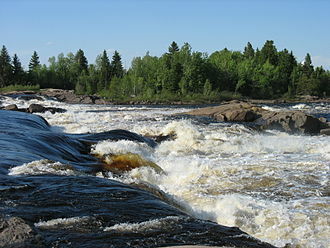 Upper Canada existed from 26 December 1791 to 10 February 1841, the upper prefix in the name reflects its geographic position being closer to the headwaters of the Saint Lawrence River than that of Lower Canada to the northeast. 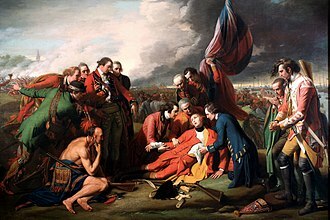 The control the French had over Canada was handed over to Great Britain in 1763 when the Treaty of Paris ended the Seven Years War in America. The territories of modern southern Ontario and southern Quebec were initially maintained as the single Province of Quebec, from 1763 to 1791, the Province of Quebec maintained its French language, cultural behavioural expectations and laws. This region quickly became culturally distinct, while the act addressed some religious issues, it did not appease those used to English law. Upper Canada became an entity on December 26,1791 with the Parliament of Great Britains passage of the Constitutional Act of 1791. The act divided the Province of Quebec into Upper and Lower Canada, the first lieutenant-governor was John Graves Simcoe. On February 1,1796, the capital of Upper Canada was moved from Newark to York, which was judged to be less vulnerable to attack by the Americans. Upper Canadas constitution was said to be the image and transcript of the British constitution. 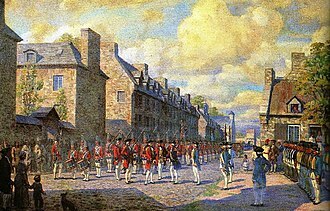 The Executive Council of Upper Canada had a function to the Cabinet in England but was not responsible to the Legislative Assembly. They held a position and did not serve in administrative offices as cabinet ministers do. Members of the Executive Council were not necessarily members of the Legislative Assembly but were members of the Legislative Council. 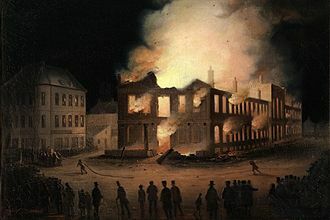 The Legislative branch of the government consisted of the parliament comprising legislative council, forces in the War of 1812, burned again by accident. The site was abandoned for another, to the west. The Legislative Council of Upper Canada was the upper house governing the province of Upper Canada, although modelled after the British House of Lords, Upper Canada had no aristocracy. Members of the Legislative council, appointed for life, formed the core of the group, the Family Compact. The Canadian dollar is the currency of Canada. It is abbreviated with the dollar sign $, or sometimes Can$ or C$ to distinguish it from other dollar-denominated currencies and it is divided into 100 cents. Canadas dollar is the fifth most held reserve currency in the world, accounting for approximately 2% of all global reserves, behind only the U. S. dollar, the euro, the yen and the pound sterling. In 1841, the Province of Canada adopted a new system based on the Halifax rating, the new Canadian pound was equal to four US dollars, making one pound sterling equal to 1 pound,4 shillings, and 4 pence Canadian. Thus, the new Canadian pound was worth 16 shillings and 5.3 pence sterling, the 1850s was a decade of wrangling over whether to adopt a sterling monetary system or a decimal monetary system based on the US dollar. In 1851, the Legislative Council and the Legislative Assembly passed an act for the purposes of introducing a sterling unit in conjunction with decimal fractional coinage. The idea was that the coins would correspond to exact amounts in relation to the U. S. dollar fractional coinage. This gold standard was introduced with the gold sovereign being legal tender at £1 = US$ 4.86 2⁄3, no coinage was provided for under the 1853 act. Sterling coinage was legal tender and all other silver coins were demonetized. The British government in principle allowed for a decimal coinage but nevertheless held out the hope that a unit would be chosen under the name of royal. However, in 1857, the decision was made to introduce a decimal coinage into the Province of Canada in conjunction with the U. S. dollar unit, in 1859, Canadian colonial postage stamps were issued with decimal denominations for the first time. In 1860, the colonies of New Brunswick and Nova Scotia followed the colony of Canada in adopting a system based on the U. S. dollar unit. In the following year, Canadian colonial postage stamps were issued with the shown in dollars. The U. S. dollar was created in 1792 on the basis of the weight of a selection of worn Spanish dollars. As such, the Spanish dollar was slightly more than the U. S. dollar, and likewise. The University of Toronto Scarborough is a satellite campus of the University of Toronto. Based in the Scarborough district of Toronto, Canada and it was established in 1964 as Scarborough College, a constituent college of the Faculty of Arts and Science. The college expanded into a mid-sized university following its designation as a division of the university in 1972. Academics of the campus are centered on a variety of studies in the disciplines of management and sciences. Its neuroscience program was the first to be offered in the nation, the campus is noted for being the universitys sole provider of cooperative education programs, as well as the Bachelor of Business Administration degree. Through affiliation with the adjacent Centennial Science and Technology Centre, it offers enrolment in joint programs, the campus has traditionally held the annual F. B. Watts Memorial Lectures, which has hosted several internationally renowned scholars, since 1970. Its nuclear magnetic resonance laboratory was the first of its kind in Canada, the original building of the campus was internationally acclaimed for its architectural design. The Dan Lang Field, home to the team of the Toronto Varsity Blues, is situated at the campus. The mansion included 17 rooms, a barn, a coach house, over the following years, over 100 acres of the estate was used as farmland. Following the death of Miller Lash in 1941, the estate was acquired by E. L. McLean and he made new additions to the estate, including a swimming pool and change room, and a retaining wall made in stone. About 82 hectares of property was purchased from McLean, just before his death, by the University of Toronto for about $650,000 in 1963. The groundskeeper of the land would continue to reside in the Highland Creek valley for the next 29 years, the University of Toronto established the Scarborough College as part of the institutions collegiate university system and declared the campus as a branch of the Faculty of Arts and Science. D. C. Williams was appointed as the principal of Scarborough College, the colleges faculty, consisting of 16 members, was established and headquartered at the main campus in Downtown Toronto. This is similar to what would be called a college athletic conference in the United States. OUA, which covers Ontario, is one of four such bodies that are members of the governing body for university athletics. OUA came into being in 1997 with the merger of the Ontario Universities Athletics Association, the first formal organization of intercollegiate athletics in Canada took place in 1906 with the formation of the Canadian Interuniversity Athletic Union. This organization had four members, Ottawa College, Trinity College, McMaster College. As the years passed, the CIAU expanded until in 1954 the union had nineteen members, in 1954, the administration of the CIAU was becoming somewhat unwieldy. It was felt that the name Canadian Intercollegiate Athletic Union was not truly appropriate since intercollegiate athletic associations were in existence in other parts of the country. The original members of the O-QAA had been joined by the Assumption College and were joined in 1961 by Waterloo and 1968 by Carleton University, in 1968, the O-QAA was divided into Eastern and Western Divisions in order to facilitate the scheduling of events. The 1960s saw the creation of Canadas first national governing body for university athletics, in 1971, the Quebec-based universities in the O-QAA withdrew from the Association. Laval, McGill and Montreal elected to pursue their future athletic endeavours in the newly formed Quebec Universities Athletic Association, in the resulting reorganization meetings, the remaining members of the O-QAA voted to change their name to the OUAA. Invitations were extended to all Ontario universities to participate in the reorganization meeting, as part of the reorganization, it was decided that all the trophies, etc. of the O-QAA would remain with and be recognized by the OUAA. The Ontario Womens Interuniversity Athletic Association was founded in 1971, which provided competition for women students in the universities of Ontario. The OWIAA was unique in North America in both its longevity and singleness of purpose and this coalition was the only association for womens athletics to have survived through 60 years of commitment to women athletes in Ontario universities. The Royal Military College of Kingston was admitted to the OUAA in 1973, in 1973, Waterloo Lutheran University changed its name to Wilfrid Laurier University. The continuing evolution of the OUAA saw three Quebec-based universities receive playing privileges in the OUAA football league in 1974, in 1978, the CIAU changed its name to Canadian Interuniversity Athletics Union. In 1980, football was reorganized so that the teams of the Ontario-Quebec Intercollegiate Football Conference- West Division would form the new OUAA Football League, the OQIFC East teams, Ottawa and Queens would join the three Quebec schools in the new OQIFC. In 1987, the OUAA awarded playing privileges in hockey to three Quebec schools, McGill and Trois Rivieres, nipissing University was admitted in 1993 with full membership. July 1,1997 marked a new era of university sport in Ontario, both the OUAA and the OWIAA amalgamated to form one association, Ontario University Athletics. In November,1997 the OUA hired the organization’s first Executive Director. Western goalie Zach Grace (2014). Generally MiST has 148 seats set up, but the capacity is often increased for lecture style events. The southern facade of Hart House. Soldiers' Tower on the southwestern corner of Hart House is visible at left. Looking west: Science Wing ahead, Bladen Building on the left, and the Arts and Administration Building on the right. The University of Toronto Bookstore operates a branch at Scarborough. The Student Centre is a landmark for student activities at the campus.